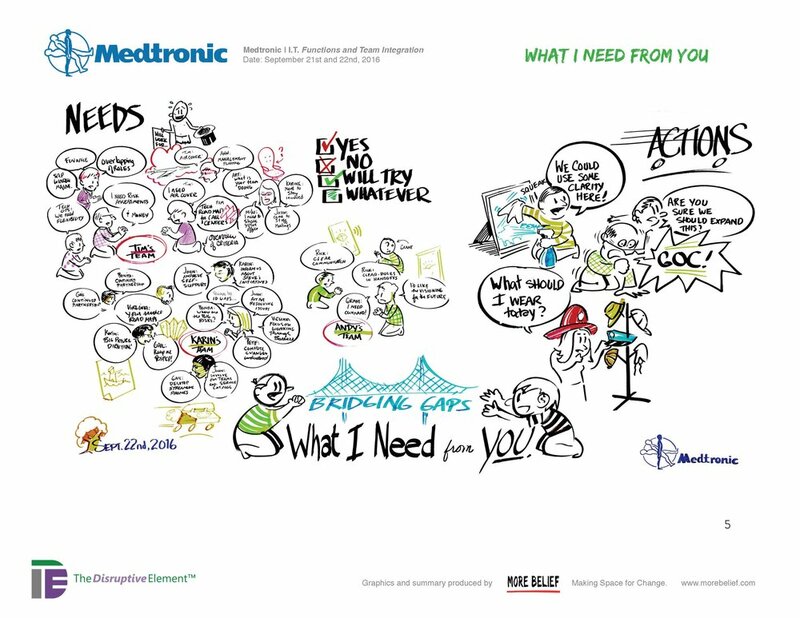 See a sample of our work and view the results of custom graphic recordings. The client was concerned they wouldn't remember the chronology of their strategic branding session, so More Belief rolled up their sleeves and shot a time-lapse video delivered on site at the end of the day. Clients often work with our writing team to add voiceover summaries. 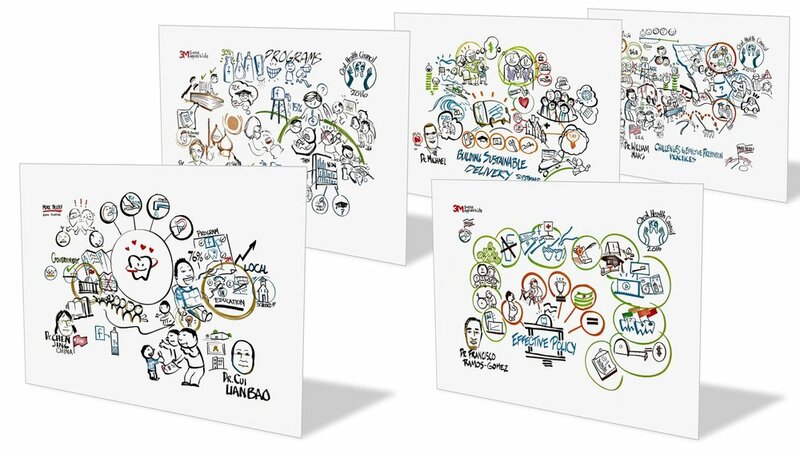 Working with a global council of oral care practitioners at 3M in their health care unit, More Belief used pre-production time to learn as much as possible about the kinds of ideas that normally would have to be captured in writing, and built a library of imagery that could be understood across 14 languages. 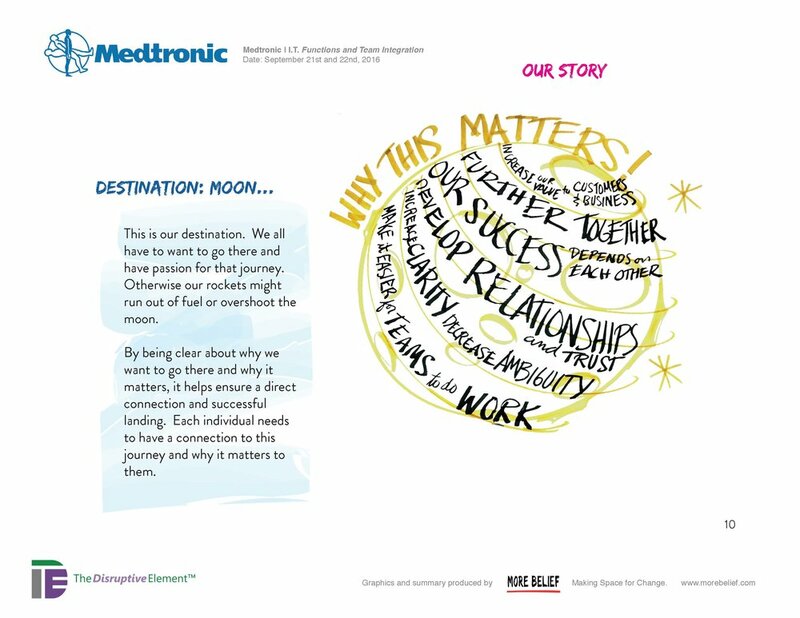 After an epic 2-day team strategy session at Medtronic, More Belief kept the story relevant, current, and memorable, by breaking down the graphic recording into a visual summary. Anyone can brainstorm some core values that sound good, but the City of Medina wanted to connect their real-life behaviors to their values. More Belief created a poster based on the images created live, and the real hand-writing of the contributors in the room as a way of tying an artifact to their commitments. 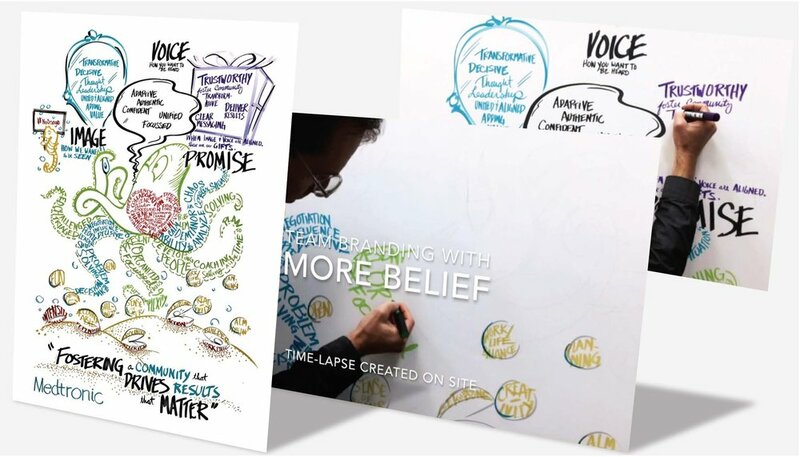 Working with Cisco to present a new change to a massive global audience of over 10,000 attendees in 3 days, More Belief planned, designed, and executed a drawing on stage, interacting with the presenters to create a seamless story that managed the change. With limited time and a really rapt audience, the client wanted to figure out how to create the most impact. The presenter already worked hard to translate their message into interactive experiences, the drawings conveyed lasting artifacts of how body language and scenarios could be remembered for future encounters with the media. He even wrote a blog post about it! The Bush Foundation trusted a group of learning leaders to define a new approach to education, More Belief turned their recorded thoughts into a journal they could bring on visits to record their observations. Leaders must find a way to bridge their personal values with their business goals. More Belief put the Business Model Canvas to work for the consultants at Disruptive Element so they could rock a leadership retreat like none other.